Rio tells the story of Blu (a lovably neurotic Jesse Eisenberg), an endangered macaw who ends up in cold Minnesota, adopted and domesticated by Linda (Leslie Mann). Their lives change when ornithologist Tulio (Rodrigo Santoro) convinces them to return to Rio de Janeiro, Brazil to help save the species. Not so fast, says his would-be mate, Miss Independent female macaw Jewel (still perky Anne Hathaway). The pair soon find themselves on the run (on the fly?) from bird smugglers. And of course, what better time to be in Rio than during Carnival?! The supporting characters helped make the movie as entertaining as I found it. The list is a who's who of the funniest voice talents around: Wanda Sykes, Jane Lynch, Tracy Morgan, and Jamie Foxx. Will i Am and Jamie Foxx contributed to the toe-tapping, hip-swaying soundtrack. Sergio Mendes served as executive music producer after all. The main star of the film is the city itself. The film was co-written and directed by Carlos Saldanha, who hails from Rio De Janeiro. His love for his hometown is evident from the bright, flashy colors and lively samba sounds. Even in 2D, the views of the Christ the Redeemer statue, the lush forests and mountains, blue skies, and even the Santa Teresa tram, are breathtaking. 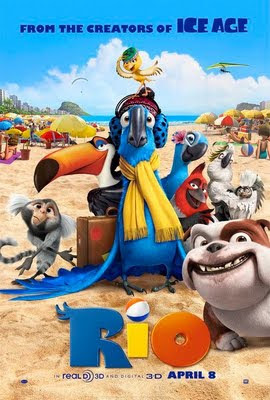 So for some light-hearted spring/summer fun, go see Rio with your kids.